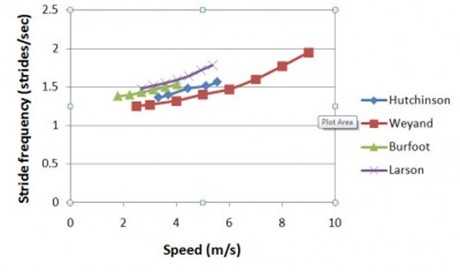 Muscle Tuning and Leg Stiffness: Why Shoes and Running Surfaces Do Matter? Over the past few months I’ve come to a few conclusions about my preferences in running footwear. In general, I prefer shoes to have either a fairly soft midsole (e.g., Saucony Kinvara, Mirage, and Peregrine; Nike Free), or virtually no midsole at all (Vibram Fivefingers, Merrell Barefoot, Vivobarefoot, etc.). Shoes that have a substantial but rather firm midsole don’t seem to work so well for me (e.g., Saucony Fastwitch 5, Somnio Runaissance, New Balance Minimus Road). I’ve had a hard time reconciling these rather disparate preferences – there really is not a whole lot in common between the Saucony Kinvara and shoes like the Vibram Fivefingers, so why do both seem to work on my feet? Lately I’ve been doing a lot of reading about running biomechanics (I guess this isn’t much of a change from the norm…), and in particular I’ve been digging into Benno Nigg’s theories on muscle tuning, as well as the literature on leg stiffness adaptations during running. I’m starting to think that my shoe preferences might be explainable by some of what I’ve read. 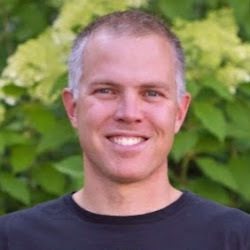 In a nutshell, muscle tuning is a hypothesis put forth by biomechanist and long-time shoe researcher Benno Nigg that suggests that we tune our muscular response to ground impact from step to step in order to minimize vibrations that pass through the soft tissues of our lower limbs (see Nigg, 2001 or Nigg and Wakeling, 2001). Every time your foot makes contact with the ground when you run, the soft tissues in your legs (muscles, tendons, ligaments, etc.) jiggle or vibrate relative to the bones that they are attached to. Too much jiggling can damage these tissues and cause soreness, and thus the muscle tuning paradigm suggests that we modify our muscular response to impact in order to minimize the jiggling. In this paradigm, impact acts as an input to tell the muscles what to do. For example, if impacts are hard, we tense up the muscles a bit to reduce the jiggle, and thus we might expect to see greater activity in the muscles. Where things get a bit complicated is when you consider the fact that the frequency of the vibrations initiated at impact can be variable. Ideally, we want the frequency of the vibrations initiated at impact to be different than the natural vibration frequency of our soft tissues. To understand the concept of natural frequency, Nigg uses the analogy of a wine glass – if you tap a wine glass with a metal spoon it vibrates and makes a sound – this is the natural frequency of the glass. If the vibration frequency at impact is too close to the natural frequency of your soft tissues, a phenomenon called resonance occurs and jiggling is maximized (I think I’ve got this correct – some of it is a bit beyond my comprehension still!). This is where shoes and running surfaces come in – they can alter the interaction between the foot and the ground, just as adding liquid to a wine glass can change the vibration of the glass and the sound produced. Variations among shoes and surfaces can alter the vibrations that pass up the leg, either for the better or for the worse. A similar logic can be applied to compression gear – one of the potential benefits of compression gear is that it can reduce the jiggle and any damage that might come along with it. The goal under the muscle tuning paradigm would be to find a shoe that is tuned properly to the natural frequency of your individual body – in doing so, you can theoretically minimize the jiggle and maximize comfort and efficiency. A hard midsole or surface will tend to increase vibration frequency, whereas a soft midsole/surface will tend to have the opposite effect. Somewhat paradoxically, in his book Biomechanics of Sports Shoes (2010), Nigg states that the tenets of the muscle tuning paradigm suggest that a light/well-trained individual would be better suited by a softer shoe (presumably since they have a higher natural frequency in their tauter soft tissues), whereas a heavier/poorly trained individual would be better suited by a firmer shoe. Got it? Another thing that happens as we run is that we modify the stiffness of our lower limbs in order to maintain a relatively stable displacement of our center of mass (see Ferris et al., 1998 for an excellent summary). In this sense the mass of our body can be viewed as a weight, and our lower leg can be viewed as a spring that supports that weight – this is known as the mass-spring model of running. Moving the center of mass (COM) up and down is energetically costly, and the body seems to have an inherent desire to control the displacement of the COM in order to keep it as stable as possible regardless of what is happening underfoot. If viewing a runner from the side, this can be thought of as a relatively stable up-down position of the head and trunk regardless of the type of surface the runner might be passing over at any given moment. To give you an extreme example of this, think about what would happen if you were to run across a hard gym floor and onto a trampoline. What would your legs do? Most probably, when you hit the trampoline your legs would remain extended to a much greater degree at each joint than they were while running over the hard floor – in other words, your legs would be straighter on the trampoline. The springiness of the leg is a function of its joints – the hip, knee, ankle, and in some cases the bones and connective tissues of the forefoot and arch. As a general rule, leg stiffness will increase on softer surfaces, and will decrease (i.e., the joints will bend more) on hard surfaces. It is possible, however, that there may be a cost to extremes of stiffness in either direction. Too straight a leg could increase impact through the bones (think of the jolt you get when stepping unexpectedly off a curb), whereas a leg with extreme bending at the joints could work the muscles of the leg a lot harder (i.e., a wasteful, inefficient gait). The mechanism by which these stiffness adaptations are accomplished is not entirely understood (at least by me), but it seems to happen on the fly, and we are able to make the necessary changes prior to stepping on a new type of surface if we know that a change in surface properties is coming (e.g., see this paper by Ferris et al., 1999). Conversely, unexpected changes can cause trouble, and in his book Nigg tells an interesting story about how he was able to help reduce injury rates among Cirque du Soleil performers by advising them to redesign their stage from a compliant surface supported at regular intervals by hard beams (e.g., and unpredictable hard/soft surface) to a uniformly hard surface (i.e., a predictable surface). He told the story in reference to muscle tuning, but it seems it could equally apply to stiffness adaptations. So how does all of the above relate back to my running shoe preferences? I suspect that each of us has a certain range of leg stiffness that is tolerable for us while we run, and that we each have slightly different natural frequencies for the soft tissues in our legs. Our individual tolerances are probably determined by our bony and muscular anatomy, body weight, training status, and a variety of other factors. Thus, what makes a given shoe comfortable for one individual and not for another may tie back to factors such as these. If I had to guess, I probably do very little forefoot running in the Saucony Kinvara – most of the time I’m probably landing either flat or slightly toward the heel. What this does is largely remove the forefoot and ankle as springs in the chain to cushion impact (the ankle and arch will still likely play some role via pronation and subsequent arch compression), and replaces them with the soft, compressible midsole of the shoe and probably greater bending of the knee. Because the midsole of the Kinvara is soft, the exchange works for me, and I can run comfortably in the shoes. Interestingly, I have found that my Kinvaras are less comfortable now that I have put over 200 miles on them, and I think that this might be because the midsole has broken down and no longer has the same degree of softness that it once did. This probably leads me to adapt my leg stiffness slightly when I run in them, leading to slightly greater flex at the joints. This in turn, might be sensed as a bit more effort required to run in them. Just speculation, but it makes logical sense. Now, a different thing happens when I run in a shoe like the Vibram Fivefingers (VFFs). In the VFFs I think I do a lot more forefoot striking, and thus I incorporate the ankle/Achilles tendon as an additional shock-absorbing spring in the chain of the lower limb (probably the forefoot to some degree as well). This is an adaptation to the lack of cushioning in the shoes – my muscles, tendons, and ligaments do the work instead of a soft midsole. The end result though is the same – I can run just as comfortably in VFFs on hard surfaces as I can in my Kinvaras, I just use different mechanisms (incorporation of the ankle and arch via a forefoot strike) to keep the displacement of my COM more or less constant. This also might explain why people see resolution of knee problems or initiation of ankle/foot problems when they run in shoes like the Vibrams – there is less reliance on the knee as a spring, and greater reliance on the ankle and foot. Now what of shoes with a firm midsole? If I had to guess, a shoe with a relatively thick, firm midsole like the NB Minimus Road feels bad to me because the firmness of the midsole combined with the firmness of the road lead me to have to bend my knee and possibly my hip to a greater extent in order to maintain displacement of my COM (there’s little give by the shoe or the ground surface). 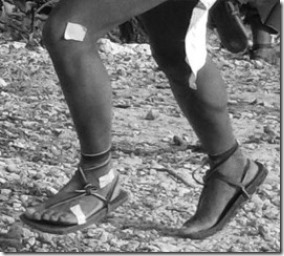 If I forefoot strike in a shoe like the Minimus, this might not be a problem, but I generally have trouble forefoot striking in any shoe that does not have an ultrathin, flexible sole (e.g., Vibrams, Merrell Barefoot, Vivobarefoot, etc.). This might also explain my reaction last summer to running in my Kinvaras on a rubberized track – I didn’t enjoy it much because I had the strong feeling that the soft shoe on a soft surface just didn’t mesh well together – perhaps my legs had to stiffen beyond their normal comfort zone to handle the doubly-soft surface underfoot. One idea that all of this suggests to me is that maybe I should stop fighting what my feet/legs want to do in a given pair of shoes. The human body is very intelligent and perceptive, and it seems to be pretty darned good at figuring out what to do given the conditions it is presented (and it can adapt on the fly!). Maybe trying to force a forefoot strike in a shoe like a Kinvara is the wrong approach? Maybe shoes do matter as much or more than form in that they dictate what form you body will want to use in any set of shoe/surface circumstances? Maybe I should just go with the flow, give my body the shoes that it likes, flip on the autopilot switch, and enjoy my runs? I’m not sure whether stiffness adaptations or muscle tuning is more important, or if they go hand in hand (I have focused moreso on the former in this post). All of this is mostly just me thinking out loud and mulling publicly some of the thoughts that have been going through my head of late. I’m not sure how any of this might be applied in a practical sense short of running in lots of different shoes and seeing what works best (I’m lucky to have been able to do this! ), but I’m curious as to whether others might have had similar experiences and/or thoughts on these topics. Feel free to share in the comments! much for speed workouts our shorter races. What an interesting article, great stuff Pete! This honestly makes me more excited about the Brooks Pure Project. Kinvarna didn’t work for my exceptionally low arches, Altra Instinct was too wide to prevent lateral slippage and banged up toes, and the Inov-8 Road-X line have a very firm sole. The Green Silence has been good to me, but I’d love to drop about 5mm off the back of it. This is very interesting. I am about 130 pounds(I’m 13) and can run a 4:50 mile but I hate the squishiness of the Kinvara on the road. On the other hand I love my shoes to be squishy when I am out on the trails. I know what he was saying will not be true for all runners and it’s interesting to hear all the different opinions from the comments on your blog. Thank you for this piece. as an owner of a running store this lends credence to what we experience in customers…what each person likes is very personal to them. So for all the runners out there- try the shoes on at your normal running speed and gait pattern and see how they feel. Trust yourself and not a review. Maybe one dy there will be a frequency rating. Elite tennis players have figured out how they tune their strings to their specific feel…this all may trickle down. Getting widely different reactions to the same footware is an interesting challenge – as you say reading a review is no substitute for actually trying shoes on yourself. I certainly have regretted buying shoes online after reading rav reviews only to find that they just done work for me. I do hope as we keeping pushing for an understanding of how shoes affect our gait and our experience of running we will start to tease out why such different reactions occur, and rather than seing personal choices as being quite discrete responses to footware we can see the underlying relationships at play. I’m drawn to conlusion that while we are all individuals we are all human with the same basic mechanics, albeit rather complex mechanics, especially once you stick shoes on! I’m optimistic that a deeper understanding will help us work out what footware choices will do for us, and when things breakdown to work out why and how better to fix it. Fixing things sometimes mean going outside ones normal choices and outside ones comfort zone – going barefoot or into five fingers to fix a running gait is good example how one can push outside of the envelope and if one successfully transistions how ones comfort zone has be redefined. Thank you for this detailed, personal analysis. I’m a forefoot runner, and have been so, so thrilled with all the options available for me now. What’s interesting about your experience is that it seems to run counter to some of the research I’ve encountered lately that suggests that our running form doesn’t necessarily adapt to new shoes. That is, heel strikers are still heel strikers once they velcro those Vibrams on. can sometimes be hard to break. Pete, very interesting thoughts here, as always. I am experiencing something similar. I can run and race comfortably in Brooks Launch (soft) or Trail Gloves (hard), but have had issues in Brooks Green Silence and Minimus. Maybe “transitional” shoes of this type are in a middle ground that doesn’t lend itself to either method of footstrike. Btw, I think you and I have similar body types, (5′ 9″, 145 lbs), so as you say it may be related to that. about 10 and see what it does to my race times. Interesting ideas to ponder over Pete. You post got me thinking about the difference in effective stiffness we get when we land on localized areas of a shoe rather than when we land evenly. If we land on just the heel or just the forefoot then this area will deform to the loading much more strongly than if we apply the same load over a wider area. This will have several effects – one the shoe will feel firmer when landing more flat footed than when you land on a specific part of the foot. Second when landing on localised area and then flattening the foot a local area which is deformed might spring back whilst the rest of the midsole deforms under load – which will create a rolling senstation. For a firmer sole this deform/undeform induced movement/senstation will be less siginifcant and may be absent all together. If we wind back to the research that suggests that we land firmer on softer more yielding surfaces craving stability then perhaps this rolling of the foot as you move on to stance might be a signal of instability – so you avoid it in soft cushioned shoes by landing more flat footed and avoid the local deformation problem. In firm soled shoes there isn’t this inherent instability so you can safely land on more localized areas – i.e. on your forefoot, something you’ll want to do anyway to provide the softer loading on your body to account for the firm sole. If we assume the above thinking as sound then it’d suggest that we’d have three classes of shoes for different gaits – forefoot strike minimal sole cushioning, flat footed – even thickness and density of cushioning, heel striker – soft heel, firm forefoot. I believe the above is reasonably sound, and needn’t be mutually exclusive to your thoughts on resonant fequency and cushioning. In fact there will be interplay – the more flat footed landing will result in greater effective stiffness and less rolling. Also the rolling of the foot through stance will result in different loading across the different sides of the foot and legs so the waves that ride up though your leg wouldn’t be symetric. When I say rolling I would typically expect this to be in form of pronation, but given there are lots of ways that a shoe can defom and lots of ways we can apply and remove loading this motion could easily be more complex. Putting these two sets of ideas together possibly provides an stronger explanation for your shoe + gait preference. 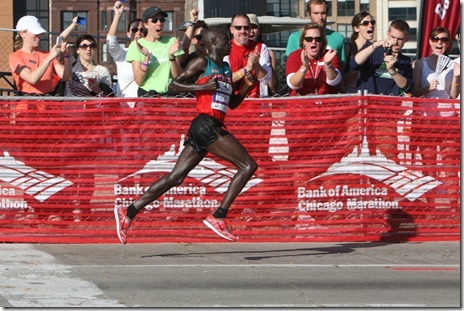 straight leg with locked knee that we see in over striding runners? It’s easy to get lost in thought about this stuff, isn’t it! Rather than attempt to answer this right away, I’ll string you along with analogy/further thoughts about how to think about the issues. I’m inclined to think that we tune our gait to minimize percieved discomfort and stress on bodies – following the gradient of reducing stress on our bodies, even if that does lead us trapped in local minimum. Think about a trampoline mat stretch tight with strings pulling down at different places on the mat to deform it to create local minimum – if you drop a ball bearing it’ll fall towards what ever is the nearest minimum and get trapped there, even if it’s not actually the lowest minimum of them all. For the different types of footware we could put on our feet we could have different strings and hence different local minimum, so for a soft high heel drop shoe we’d get a minimum quite distinct from the one running barefoot, and in between we’ll likely get other local minimum for each of the different classes of shoe. It might be that the barefoot running gait is the least stress alround, but if moving towards it from a heel strike in traidtional shoes temporarily increases stresses on the body we’ll naturally restist this and return the local minium associated with heel striking shoes. Now to head back to having a bash at answering your question about do shoft heeled shoes encourage landing with a straight leg. Well a straight leg is one where the quads are lightingly loaded for the amount of force that can be pushed through the legs into the hips – the straighter the legs the less this force on the quads, so I could easily see that to minimize the stress/shock loads on the quads landing with a straighter leg will feel better. Now if you aren’t punished for landing with a straight leg because the loads on the heel on well cushioned/forces distributed aross the whole heel then we won’t have the stress on the feet shouting to tell us we are doing something that might be amiss. So rather than encouraging a straight leg the shoft heeled shoe probably doesn’t discourage it, so the body just follows the gradient down to the local minimum – landing on the heel with a straight leg. Problems come with this because our feet have far higher nerve density than our joints on muscles so if we lull our feet into being atrificially happy about the loads then we can easily overload other parts of body without it gives us an early warning. One way to test this out would be to stick a hard plastic covering over the heels of your insoles so that the loading isn’t distributed so widely so we can more localized concentrations of force on the heel – which should make the nerves shout a little load to get heard. If by doing this a runner starts landing more softly by landing with a more bent knee then we know that there is link between dulling our senses in our feet and overstridding. Also on the track of local minimum being what we are drawn to, I believe that the large dorsaflexion is probably just a cases of following the gadient down – if you are landing with a straight leg on your heel then the one of the few options left to you to further reduce the stress on landing is dorsaflex more to give your ankle more angle to rotate through to disapate the loads. Activating the shin muscles to control the rotation and thus give a smoother landing will also be a trait. If your shin muscles shout less hard than your soles of your feet then you’ll keep doing this. I suspect that this tuning of gait to follow the gradients down to the local minimum is all subconcious – it just happens automatically, and to override you have to conscously think about your movement and placement of body. Footwear, habits, running surfaces, injuries, fatigue, emotions/mental state are likely to effect how our body responds and finds the local minimum – for better or worse. A lot of people ask me how I can take “all the pounding” of running on tarmac in my VFFs, and I generally get looks of disbelief when I say that there is no pounding. Your article does a pretty good job summarizing the theories behind why this is the case. Interesting point on compression gear and vibration reduction wrt muscle soreness. Your comment about how going from heel to forefoot striking is trading knee for ankle/foot injuries strikes a chord with me. Two surgeries and arthritis in my knee led me to work on my running form. Sure enough, my knee is better, but I do have occasional battles with my Achilles tendon now. The tendon issue is manageable through concentration on proper form, as well as calf strengthening exercises (eccentric calf drops), whereas only rest would help my knee issues. shoes. The old trend was toward bigger heels and corrective shoes. cushioned shoes and tend to get more on my forefoot while crossing. wooden bridges tend to slow me down. Very interesting article (as always). I have also noticed how different surfaces affect my running form. I run most of my miles in VFFs or Merrell Trail Glove with surfaces ranging from running track, trails and normal tarmac roads. One of the big things I have noticed is how much more muscle soreness I get when I run on tracks. When running on “hard” surfaces I get almost no soreness in the calves and feet’s but when running on track (the soft type made of some rubbery material) I can be sure to feel soreness the following day. I also feel like the track is draining energy while running on hard surfaces produces a lot shorter ground contact and almost “springy” feeling. I feel a lot less heavy running on hard surfaces. compression leg sleeves (CEP All Sports Compression Sleeve) that just covers the calves. After that I have been able to almost double my weekly mileage over a period of time while feeling fresh most of the time. My thoughts now are if there are any downsides to run almost every run with compression gear and also using these a few hours afterwards for increased recovery? My gut feeling is that it is probably better to alternate but then I may have to decrease my training loads. Any thoughts about this? compression, but I also use it sporadically. The compression leg sleeves will have more to do with muscle tuning than leg stiffness. By using the compression sleeve, you are starting to alter the vibration and ‘tuning’ of the muscle, and this is where Nigg is going with his research. My personal experiences seem to parallel yours Pete, despite my efforts to improve my form I find it difficult to forefoot strike in “traditional” soled running shoes. I still land slightly back on the midfoot, even when shortening my stride and landing under my COM, but transitioning to a midfoot foot placement has helped quite a bit. My VFF’s made it extremely easy to to adapt (although I have yet to do much significant mileage in them) a forefoot strike, though there was some initial heel-striking as I became accustomed to how they worked, and I don’t seem to have to consciously force myself to stick with it. As I’m currently shopping around for new marathon shoes this will be something to keep an eye on, comparing what has worked and not worked in the past with what’s being offered on the shelves. in different people who run differently – aghh! Pete- I have relatively the same experience as you do with shoe choice. I use the Kinvara and Vibrams predominantly, and the NB MT 101’s absolutely destroy me feet. (I would assume the minimus road would do the same.) What is weird is that I am a 6’1″ 175-180# which I would think heavy for running standards and my kinvaras lasted all of 100 miles before I had to get the second kinvaras. During my purchase I almost got the minimus but then remembered my MT experience. Considering this history and your post (I’ve looked into the resonance also. I am an ATC with a masters in exercise science so I do a lot of reading on numerous topics like this.) I find it strange that the fimer sole doesn’t work for me. I CAN NOT heal strike nor midfoot strike. I wore VFF Sprints for a year exclusively and it has forever changed me. Even in my Kinvaras I can’t do anything but forefoot strike, which ultimately led to their demise since the anterior portion of the shoe is destroyed and the micro ridges in the heal are virtually untouched. 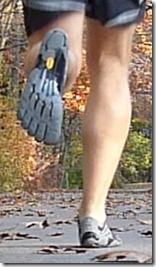 Now I also use the Vff Bikilas, but they also don’t do well with my feet comparing them to the Sprints. Is there something I”m missing with my shoe choice or do you think this is spot on? I would consider myself a heavier runner, but maybe I’m not? I would think a shoe would last more than 100 miles for me considering my forefoot stride, but maybe it shouldn’t. It hurts the pocketbook a little (and my ears listening to my wife question why I need new shoes so often) having to get new shoes at such a rate. Any thoughts? If you want further discussion I can give you my conctact info. Have you ever tried filming yourself? I get very little wear on the soles of my Kinvaras. I think a lot of wear like you describe is not so much from the landing location, but how your foot is moving when it comrade the ground. If it is still moving forward, you tend to scuff and create friction which wears down the sole. I’m wondering if you are still reaching forward a bit as you contact on the forefoot? As an example, for the longest time I though my wife was a forefoot striker because she never puts any wear on her heels. I filmed her and turns out she was a big time overstrider with a huge heel strike. It’s just that her heel went directly into the ground rather than skidding forward along it. If you start to retract the foot a bit before contact, my hypothesis would be that the wear will go away. Think backward, backward! as you bring you foot down. Thanks, Pete. I will pay attention to that tomorrow on my next run. I’d be curious to know what your cadence is? An interesting article as always – people often wince when I tell them what I run in (Vibrams, Vivobarefoot Ultras, and Brooks GS), but your article makes a lot of sense on why these shoes are so comfortable. This is my favourite blog. Thanks for all the hard work. Thanks. 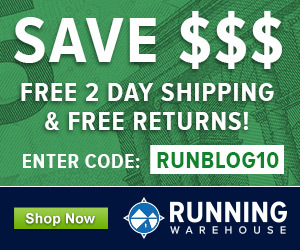 I ran in my Brooks GS the other day, and yes, they are an amazingly soft shoe. Forgot just how soft they were, maybe even moreso than the Kinvara. I think you’re right on with what you’ve said here. And to take it one step further I think that pace dictates form/impact/resonance, etc and thus shoe choice. For instance, I run in my Green Silence for everything under 10 miles cause I feel that i get better road feedback (more minimal I guess), but in Kinvaras for my long runs, which are also at a slower pace. This makes me think that ideally I should be able to run in the GS all of the time, but that on long runs (or at slower speeds) my form breaks down and I heal strike some. And lately I’ve been running in NB trail minimus for my recovery runs, because my form “has to be” so good while wearing them. Now the perfect all around shoe is NB101, but it’s just not enough cushioning for roads, which backs up what you’re saying here all along. Although I hear they’re coming out with a new road racing flat…can’t wait! Great post. I really enjoyed the article, and I am glad I read it after Grandma’s Marathon, not before. Interestingly, I was deciding between using the Minimus Roads or Kinvara 2 as the race shoe. What I had felt is that after 100 miles or so in the MRs, they had conformed more to my feet, and were very comfortable. All long runs leading up to Grandma’s were in the Kinvaras (or 2’s) or the MR. After the break-in period, both shoes seemed similar to me. BTW, I used the MR’s, had a very comfortable and fast race, finishing in 3:04:29, just off my lifetime best from 1987! The muscle tuning paradigm took a bit to re-read to make sure I got all the information right, but it makes sense. I’ve always had a hard time finding the right shoes. I am light and pretty-well trained but I have absolutely no arch in my feet. They are completely flat so most of the running shoes I get fitted for are the ones with substantial, heavy support. They help with my arches but then I feel mess with everything else. I’ve had a few pairs of New Balance and now have Saucony, I think maybe the ProGrid but cannot think of the exact shoe now. I’ve had knee surgery too-tore my ACL/MCL/PCL and cartilage so that again, creates problems. Any advice? I have flat feet and I found that I do much better in Nike Free 3.0 and currently Innov 195. In the past, I used to run in Asics 2000s and that created nothing but problems. Another flat footer here that transitioned from Brooks Beast / Asics 2000 series to Brooks GS & Innov 155. After the initial calf and achilles growing pains I am much better off for it.